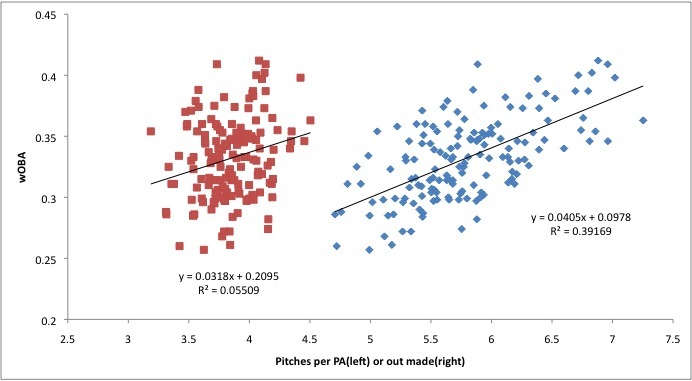 In a recent article on the Community Research pages Andrew Patrick looks at how players and teams fare when they take more or fewer pitches per plate appearance (P/PA), the idea being that you will benefit if you tire the opposing pitchers, see more of their repertoire, etc. While there is a small correlation there, you’d be hard-pressed to tell a batter not to swing at a hanging breaking ball just because it’s the first pitch. Take, for example, Madison Bumgarner’s start on June 21, 2011. The Twins only took 2.5 P/PA, but those PAs resulted in one strikeout and nine hits, chasing Madison after 0.1 innings. Maintaining a low P/PA didn’t help Bum on that day because he failed to convert those PAs into outs. To contrast with another Giants pitching performance, Tim Lincecum’s 148 pitch no-hitter on July 13 of last year saw more than 4.6 P/PA, an extraordinary number. But only 4 of those PAs (all walks) failed to make an out. Clearly not making an out trumps taking pitches. All of this leads me to a question. 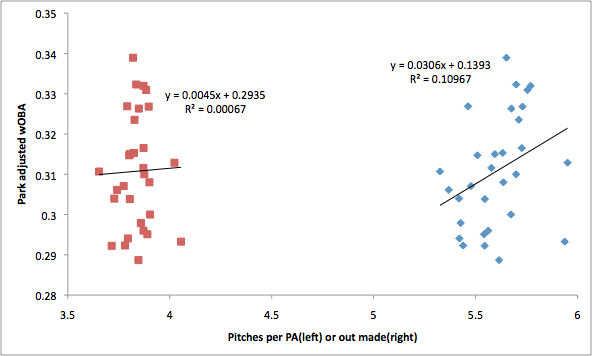 If P/PA correlates weakly with performance, perhaps that’s because we would be better served by looking at pitches seen per out made (P/Out)? I went ahead and ran those numbers for 2014 to compare the results with Andrew’s P/PA graphs. For “outs made” I’m considering only outs made at the plate without sac bunts (i.e. outs considered in OBP). P/PA is in red (left) and P/Out is in blue (right). The winners here are Stanton and McCutchen; a little more in line with what we expect when we think of good hitters. While they came in 6th and 5th in P/PA respectively, their OBPs of 0.412 and 0.409 drive them to the top of the PA/Out list. Overall we see an even better correlation and higher slope. In turns out the more we focus on outs the more fidelity we get to batting outcomes. This isn’t to say that seeing pitches isn’t important, but a great way to elevate a pitch count is not to get out. But let’s change gears for a moment. Let’s hypothetically stick Mike Napoli on a team with a bunch of free swingers. The fact that he’s doing all he can to elevate pitch counts won’t really matter if he’s the only one on his team. He may not see a wOBA benefit from his hard work. But if the entire team is trying to wear out the pitcher we might see a synergistic effect that drives everyone’s wOBA up. Here is the same data in the first graph, but for teams instead of players. The wOBA are also park adjusted. 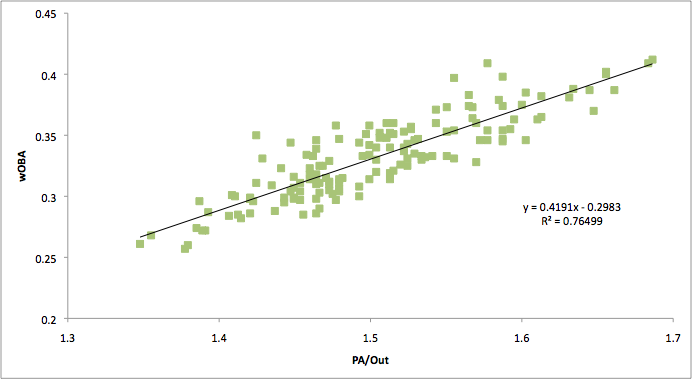 Impressively there is no correlation between a team’s P/PA and wOBA. The Red Sox, despite sporting the highest P/PA in the league, have a dismal park-adjusted wOBA while the Brewers’ league-low P/PA leads to a league-average park adjusted wOBA. You do get a small correlation once you consider P/Out, again demonstrating the supremacy of not making outs. I won’t put up the graph, but if you look at PA/Out on a team basis you get yet a stronger correlation, as you might expect. The takeaway from this is that you should take pitches if it helps you be a better batter, but that taking pitches in an of itself does not appear to do that. It certainly doesn’t add up to anything at the team level. If you think about it, this makes sense — in order to win a war of attrition it’s not enough to run up the starter’s pitch count. He’ll still start again in 4-5 days regardless. What you really want is to chase the starter early and run up the bullpen’s pitch count. That way in subsequent games they will have fewer options to close out a game or back up a starter who’s having a bad day. Of course, you may not actually reap the benefits of your hard work if you are near the end of a series. You might actually expect that if there was any effect to the Red Sox’s patience it would be to help the team their opponents face in the subsequent series.